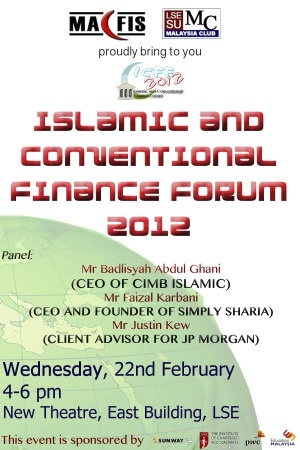 Did you know that Malaysia is the largest Islamic banking and financial market in the entire world? With assets worth over $30 billion, Islamic banking become a force to be reckoned with in the global economic scenario. It has grown over the years and is now present in over 60 countries- including the US and UK. Despite this sector becoming increasingly relevant in today’s world, how much do you actually know about it? What are the strengths and weaknesses of this system compared to conventional ways? Could the global financial crisis have been averted if the Islamic financial system had been implemented? Discover the answers to these questions and listen to what the experts have to say on Wednesday, the 22nd of February, at the Malaysian Students Department (MSD), situated at 30-34, Queensborough Terrace, London W2 3ST. Mr Badlisyah is the head of Group Islamic Banking Division as well as the Head of Corporate Client Solutions (Middle East and Brunei). He is also the Executive Director and Chief Executive Officer of CIMB Islamic Bank Berhad, Chairman of CAPASIA Islamic Infrastructure Fund (General Partner) Limited, Director of CIMB Middle East BSC (C) (Bahrain), alternate Director to the Chairman of CIMB Principal Islamic Asset Management Berhad, alternate Director of CIMB Principal Asset Management Berhad and CIMB Wealth Advisors Berhad and member of the Investment Committee of CIMB Principal Asset Management Berhad. Badlisyah is a Council Member of the Association of Islamic Banks in Malaysia, Chairman of the Islamic Capital Market Committee of the Malaysian Investment Banking Association, member of the Working Group on Islamic Accounting Standards, Malaysian Accounting Standards Board and member of the Islamic Finance Committee of the Malaysia Institute of Accountant. He has been recognised by top international publications as, among others “Top 20 Pioneer in Islamic Finance”, “Islamic Banker of the Year” and for “Outstanding Contribution to the Development of Islamic Finance” for his role in the industry globally. He is a lifetime member of ANSARA Taiping and was the Co- Founder of the United Kingdom and Eire Council for Malaysian Students (UKEC). Badlisyah holds a Bachelor of Laws degree from the University of Leeds, United Kingdom. Faizal is a qualified Chartered Accountant and spent the first decade of his career working with PriceWaterhouse Coopers and GlaxoSmithKline. In 2005 he moved into the Islamic Finance industry specialising in providing Sharia Compliant independent financial advice to individuals and corporations. His experience has also been significantly enriched by consultancy work for a leading global Sharia consultancy firm Dar Al Istithmar and for the Qatar Investment Bank. Faizal is also an Approved Trainer for the Islamic Finance Qualification (IFQ). He is committed to the development of the Islamic Finance industry and is a regular speaker on Islamic Finance related topics. In this light Faizal has worked with the UK Al Qalam panel of scholars, the UK Government on tax legislation changes related to Islamic Finance and is a member of the Islamic Finance Experts Group formed by the Muslim Council of Britain. Mr. Justin Kew Ching Wei holds a masters in Engineering from the University of Sheffield. He has been working with JP Morgan, a leading financial services firm for 5 years, and is currently their client advisor, focusing on short term fixed income product.